31 De Mayo - ¡Fiesta! Alcazar De San Juan -- Forges -- Procomd. S. A. Madrod - 23. Dep. Legal: M. 14.824-1984. Galea. S. A. Alcobendas (Madrid). Castilla La Mancha Without Teetering -- May 31st Party! Forges -- Procomd. S. A. Madrod - 23. Dep. Legal: M. 14.824-1984. Galea. S. A. Alcobendas (Madrid). This sticker is in the style of a cartoon and was made by a famous cartoon artist in Spain named Forges. Forges has worked for many prestigious newspapers such as El País, El Mundo and magaxines such as El Jueves. 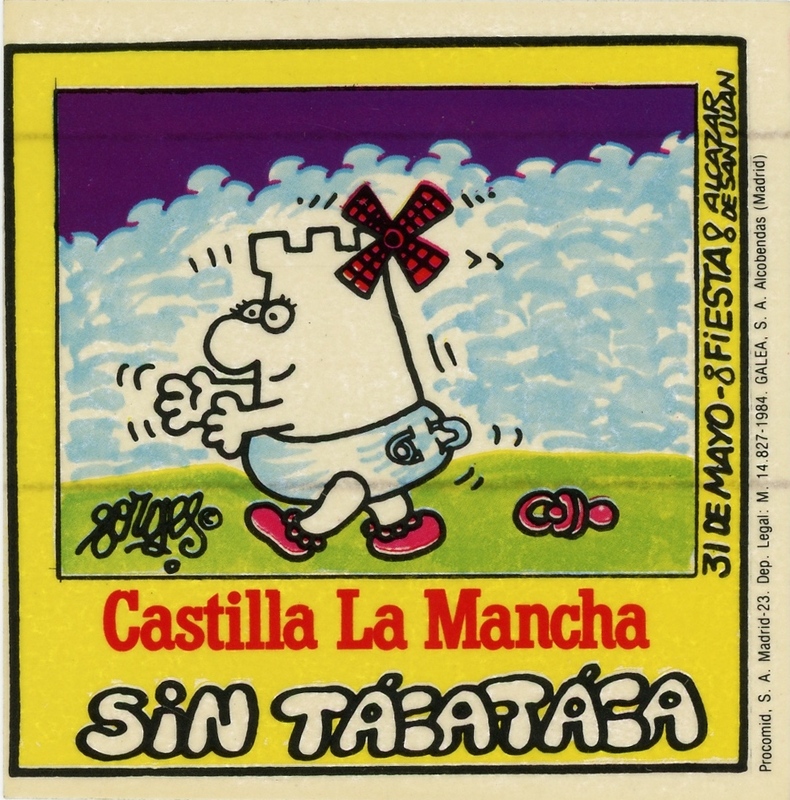 This sticker is part of a collection of at least three other stickers advertising a regional holiday in Castilla La Mancha, an autonomous region of Spain. It is one of the 17 autonomous regions in Spain, each having its own distinct wealth of cultural and natural resources. This specific region is located in the very center of Spain. The holiday represented on this sticker is the Día de la Región de Castilla La Mancha or the Day of the Region of Castile La Manch - a festival of the autonomous community celebrated all throughout it. While this festival happens every year on May 31st, other autonomous regions will have their own celebrations on different days throughout the year. The cartoon of the baby castle wearing a bow (windmill) in her hair and having a pacifier behind her is based off of the same castle that appears on the region's flag, but Forges has personified it with the characteristics of a baby girl to celebrate the region from its birth.